The proportion of occupational accidents and diseases are increasing in developing countries. It has been estimated that more than 120 million accidents occurs at work place with occurrence of over 200,000 fatalities each year in developing world. World Health Organization (WHO) stated poor occupational health and reduced capacity of workers can make loss upto10–20% of the gross national product (GNP) of a country. Worldwide, occupational diseases, illnesses, and death accounts for an estimated loss of 4% of the country's gross domestic product. In 2016, International Labor Organization (ILO) estimated that 6300 people die every day due to occupational accidents and over 2.3 million deaths occurs per year as a result of work-related diseases. In Nepal, approximately 20,000 accidents take place at workplace leading about 200 lives lost per year. A study among welders from eastern Nepal showed that 90% of workers were aware of occupational hazards and PPE and 47% were using PPE. Another study conducted among industrial workers in Nawalparasi reported 87.2% workers used any kind of PPE while working in worksite. Automobile repair artisan is one occupation that contributes to occupational accidents and disease health hazard with higher rates of occupational health hazards, which may exert an influence on workers. Automobile repair artisans are mainly involved in tasks like spraying, paintings, fixing vehicles engines, welding, cleaning, cutting, grinding, servicing etc. where they get exposed to a different hazards like light/radiation, welding fumes, sharp metals, electrical current, heat, noise, spark, vibration, chemical, and the working environment. A hazardous working condition not only brings numerous health risks to the workers' health but also minimizes the enterprise's productivity. [7–9] Occupational safety and health are important issues today, with extending labor market. To maintain an optimum standard of occupational safety and health at workplace, it is important to have an overall baseline picture of the present worksite scenario, various hazards and their probable health outcomes. Many studies, have suggested that different occupational hazards contribute to cause significant adverse health problems like accidents, hypertension, respiratory diseases, skin disease, heart disease, and musculoskeletal problems. There is an information gap on occupational hazards and its awareness among automobile repair artisans in Nepal. 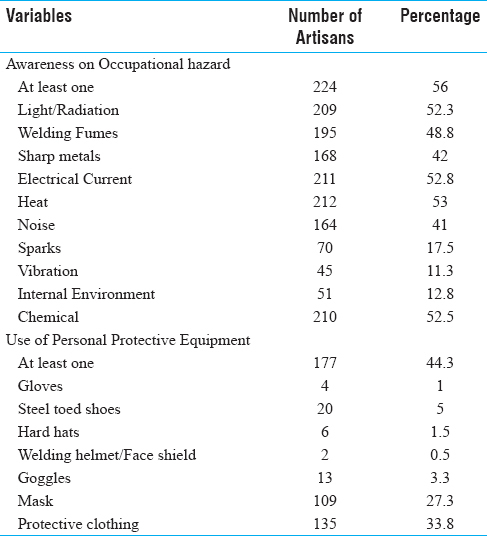 Therefore, this study attempts to assess the awareness on occupational hazards, use of Personal Protective Equipment (PPE), and the factors associated with awareness on occupational hazards among automobile repair artisans in Kathmandu, Nepal. The study findings may help to design the interventions for the targeted groups, thus promoting and upholding better health and environment with safety standards. This study was conducted in Kathmandu, a capital city of Nepal. A cross-sectional study design was adopted with sample size of 400 automobile repair artisans (two-wheeler) calculated based on the following assumptions: prevalence = 47.7%, sampling error (d) = 5%, 95% C.I., and 5% of non-response rate. Stratified followed by simple random sampling was adopted to select the study participants. Automobile repair artisans of Kathmandu metropolitan city were enrolled in the study. The two-wheeler workshop was classified into two categories: medium (employed 10–49 workers) and small (less than 10 workers). A total of 133 workshops was enrolled, having 33 medium type and 100 small types. The participants were drawn proportionally from each workshop from the provided list by simple random sampling. The exclusion criteria were being seriously ill, mentally unstable based on interviewer's judgment of participant's ability to provide answers and four-wheeler artisans. The study period was between March and September 2015. The interviewer administered semi-structured questionnaire prepared after through literature review was used to collect the information from the study participants. The questionnaire contained information on age, gender, education status, job duration, total working hour per day, training prior to work, awareness on occupational hazards, and use of PPE and was pretested on 40 automobile repair artisans (10% of sample) in workshops of Lalitpur district of similar settings to check the reliability of the study tool. The face-to-face interview was conducted by trained researcher at the work place, after obtaining the signed written informed consent. Ethical approval was obtained from the Institutional Review Committee of Manmohan Memorial Institute of Health Sciences. Statistical analysis was done using Statistical Package for Social Sciences (SPSS) version 15. Frequencies and percentages were reported for the categorical variables. Logistic regression was used to identify the factors associated with the awareness of occupational hazard and use of PPE. All the 400 participants of the study were male. The mean age (±SD) of the automobile repair artisans was 28.58 (±9.9) years. Half of the participants (50.3%) have attended primary level of education followed by the secondary and higher level (43%) and illiterate (6.8%). The mean duration of employment of the artisans was 8.16 (±SD) years. About 51.3%of artisans had ≤5 years of employment record. Of the total, 68% of automobile repair artisans have received pre-service training prior to joining the job. Notably, nearly two-third (67.5%) of automobile repair artisans works greater than 8 hours per day. Of 400 automobile repair artisans, 56% reported that they were aware of at least one or more occupational hazards. Heat (53%) was the most common hazard, followed by electric current (52.8%), chemical (52.5%), light/radiation (52.3%), welding fumes (48.8%), sharp metals (42%), Noise (41%), sparks (17.5%), internal environment (12.8%), and vibration (11.3%) as reported by the automobile repair artisans. Our findings showed that, only 44.3% of the automobile artisans were using at least one PPE at the work. Protective clothing (33.8%) was the most common PPE used, followed by mask (27.3%), steel toed shoes (5%), goggles (3.3%), hard hats (1.5%), gloves (1%), welding helmet/face shield (0.5%) [Table 1]. 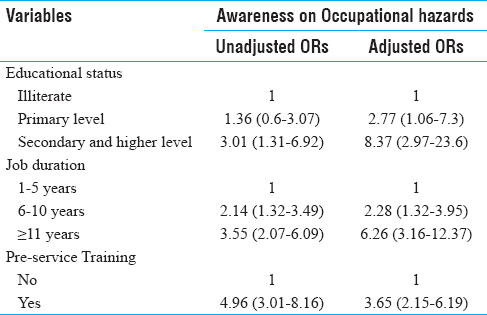 Our findings showed that those level of education status, having years of work experience and those who received pre-service training prior to joining the work were independent factors associated with awareness on occupational hazards among the automobile repair artisans [Table 2]. The artisans who attended secondary or higher level of education (OR = 8.37, 95% CI: 2.97–23.6) and who have primary level of education (OR = 2.77, 95% CI: 1.06–7.3) were more likely to be aware compared with illiterate artisans. The workers with ≥11 years of work experience (OR = 6.26, 95% CI: 3.16–12.37) were six times and 6–10 years of experience (OR = 2.28, 95% CI: 1.32–3.95) were two times more likely to be aware of occupational hazard than with the under 5 years experienced worker. Those artisans who received pre-service training on work (OR = 3.65, 95% CI: 2.15–6.19) were three times more likely to be aware of occupational hazard than those who did not receive it prior to work. Further, we found those who received pre-service training (OR = 3.41, 95% CI: 2.17–5.37) and attended secondary or higher level of education (OR = 3.21, 95% CI: 1.25–8.27) were three times more likely to use PPE at workplace [Table 3]. We found use of PPE at workplace was three times higher in the workers who were aware of occupational hazards (OR = 3.01, 95% CI: 1.98–4.57) compared with those who were unaware of occupational hazards [Table 4]. Exposure to occupational hazards result injuries, diseases and death of the workers. An occupational hazard not only harms worker's health but also minimizes the work productivity. It also has profound effect on the socioeconomic well-being of the workers, their families, and dependents. However, scientific knowledge regarding the occupational hazards on different worksite setting in Nepal is still lacking. There is paucity of information on occupational hazards and use of PPE at work among the automobile repair artisans in Nepal; most of the evidence comes from the developed nations. To our knowledge, this study is of first of its kind, examining the awareness of occupational hazards and use of PPE among the automobile repair artisans in Nepal. Automobile repair artisans especially in Nepal are predominantly a masculine job (males = 100%). The absence of female workers at automobile repair centers typically confirms, females are rarely engaged in vehicle repairs. This result is consistent with the findings from Ghana., The mean age of the participants was 28.58 (±9.9) years. Majority of workers were young; this study found 76.8% of respondents were below the age of 35 years. This finding is uniform to the study conducted in North Western Nigeria. Of the total, fifty (50.3%) percent of the participants had primary education, 43% had secondary and higher education, while 6.8% were illiterate. This finding resembles with the study from India and Nigeria. Our study showed 67.5% (n = 270) of automobile repair artisans work more than 8 hour per day. This finding is consistent with the study on occupational health and safety in Nepal, which reported, nearly 68% of workers work more than 40 hours in a week. However, a contrast finding was observed in study from Nigeria where they reported only 23.72% works more than 8 hours a day. These findings suggest there is poor implementation of ILO and OSHA (Occupational Safety and Health Administration) act on workplace in Nepal, also probably reflects the indirect poverty, which pulls them to work for more than 8 hours a day. An automobile repair artisan receiving training prior to work was found to be 31.5%. In contrast to this finding, study from Nigeria reported 98% of workers received training prior to work. Of the total, 56% (n = 224) of artisans were aware of at least one occupational hazard. This finding is lower than the results from the study among welders in Zambia (98%), Nepal (90.7%), India (83.3%), and Northern Nigeria (77.9%).,,, Use of at least one PPE at work is found to be 44.3%, which is higher than the study among automobile workers from Ghana (27%) and Nigeria (12.8%) and is lower than the study among welders from India (95.7%),,. However, this finding is consistent with the study among welders in eastern Nepal. The result of studies from Nepal, India, and Zambia are in support to our findings where we found educated workers were more aware of occupational hazards. Artisans with higher year of experience were more likely to be aware of occupational hazards. This result is consistent with the study from North Western Nigeria and Northern Nigeria. However, a contrast finding was observed from the study conducted in Nepal, India, and Zambia.. Automobile repair artisans receiving prior training to work were three times more likely to be aware of occupational hazards compared with non-prior training workers. Level of educational was identified as significant factor for use of PPE at work. This finding is supported by the study from Zambia. In contrast to this, findings from different setting,, have showed education is not significant with PPE use. Workers who had prior training to work were twice more likely to use PPE compared to those who did not receive any training prior to work in automobiles. Automobile repair artisans being aware of occupational hazard were three times more likely to use PPE at work. This finding is consistent with the study among welders from eastern Nepal. Our study provides the ground picture of awareness level and use of safety measures (PPE) among the automobile repair artisans in urban Nepal. This study reveals 56% of awareness level and 44.3% of PPE use among the artisans in Kathmandu. This level of awareness and PPE use is insufficient, and probably highlights unsafe worksite environment to the workers. Our study insists the need of awareness raising interventions and prior training to work for raising the awareness on occupational safety and health among the artisans with an aim of promoting health and well-being of the workers. Amponash K, Dartey K. Occupational health and safety, key issues and concerns in Ghana. Int J Bus Soc Sci 2003;2:119-26.
International Labor Organization. Safety and Health at Work: A Vision for Sustainable Prevention. Available from: http://www.ilo.org/wcmsp5/groups/public/---ed_protect/---protrav/---safework/documents/publication/wcms_301214.pdf. Pun KR. Occupational safety and health situation in industrial sector in Nepal. 2011. Retrieved from http: www.scribd.com/doc/50002585. Vyas H, Das S, Mehta S. Occupational injuries in automobile repair workers. Industrial Health 2011;49:642-651. Iunes RF. Occupational Safety and Health in Latin America and the Caribbean: Overview, Issues and Policy Recommendations. Inter-American Development Bank. Available from: http://citeseerx.ist.psu.edu/viewdoc/download?doi=10.1.1.198.515&rep=rep1&type=pdf. Carter WS. Introducing occupational health in an emerging economy: a Nepal experience. Ann Occup Hyg 2010;54:477-85. Monney I, Bismark DA, Isaac OM, Kuffour RA. Occupational health and safety practices among vehicle repair artisans in an urban area in Ghana. Journal of Environmental and Occupational Science 2014;3:147-53. Khan AA, Inam S, Idrees M, Dad A, Gul K, Akbar H. Effect of automobile workshop on the health status of auto mechanics in N.W.F.P., Pakistan. African Journal of Environmental Science and Technology 2010;4:192-200. Gautam RP, Prasain JN. Current Situation of Occupational Safety and Health in Nepal. General Federation of Nepalese Trade Unions (GEFONT). 2011. Available from: https://gefont.org/assets/upload/downloads/Study_OSH_Nepal.pdf. African newsletter on occupational health and safety. Finnish Institute of occupational health; September 2012. Available from: http://www.ttl.fi/AfricanNewsletter. Oranusi US, Dahunsi SO, Idowu SA. Assesment of occupational diseases among artisans and factory workers in lfo, Nigeria. Journal of Scientific Research and Reports 2014;3:294-305. Sambo MN, Idris SH, Shamang A. Determinants of occupational health hazards among roadside automobile mechanics in Zara, North Western Nigeria. Borno Medical Journal 2012;9:5-9. Jinadu M.K. Occupational health problems of motor vehicle mechanics, welders and painters in Nigeria. Royal Society of Health Journal 1992;102:130-2. Joshi SK, Shrestha S, Vaidya S. Occupational safety and health studies in Nepal. International Journal of Occupational Safety and Health 2011;1:19-26. Ganesh kumar S, Dharanipriya A, Kar SS. Awareness of occupational injuries and utilization of safety measures among welders in Coastal South India. Int J Occup Environ Med 2013;4:172-7. Abraham EG, Megbelayin EO, Akpan SI. Awareness and use of protective eye devices among auto mechanic technicians and auto spare parts traders in Uyo, Nigeria. Int J Med Sci Public Health 2015;4:1227-30. Sabitu K, lliyasu Z, Dauda MM. Awareness of occupational hazards and utilization of safety measures among welders in Kaduna metropolis, Northern Nigeria. Ann Afr Med 2009;8:46-51.